It all breaks down to be used again. In industry parlance, it is known as a closed loop system, as the materials cycle through until they are converted to commodities. It starts with our team. We have over 50 years in the industry. There are no persons sorting the actual waste, we let the machines do the work. All chemical molecules are combinations of atoms held together by the bonds between the different atoms. The advantage of an electric arc system is that the thermal energy is higher than the bonding or bond strength that holds the atoms together to form a molecule. The concentrated arc energy separates the complex compounds into the simple elements of a syngas. 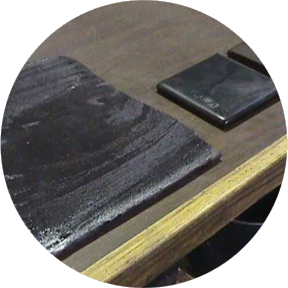 Understanding the materials is part of our technology. 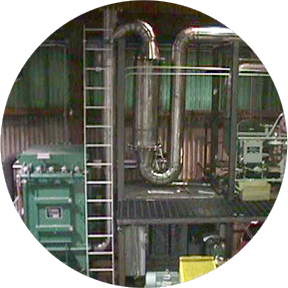 We use sophisticated monitoring equipment to completely convert the mixed incoming materials. 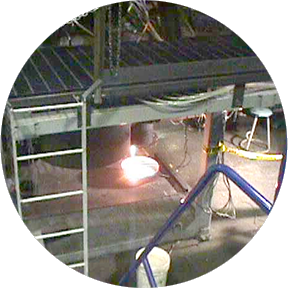 Electric Arc Furnace technology has been used to reduce iron ore, melt scrap and refine steel for over 100 years. Hydrocore's proprietary process optimizes the way energy is diverted from waste streams into hydrocarbon fuels. Each element is collected or "mined" from the waste stream and returned to industry. The proprietary process utilizes 100% organic and inorganic solids, gases and liquids to produce clean energy products, transportation fuels and industrial commodities. 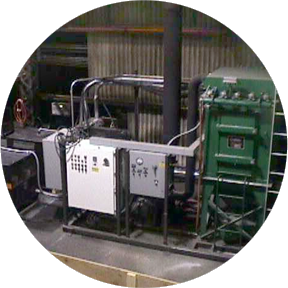 Products are produced on a highly effective and cost-efficient basis without incineration, and with zero pollution converting all waste to commercial products. What was once useful can be so again. The basic building blocks are collected and sent back to various industrial sources. 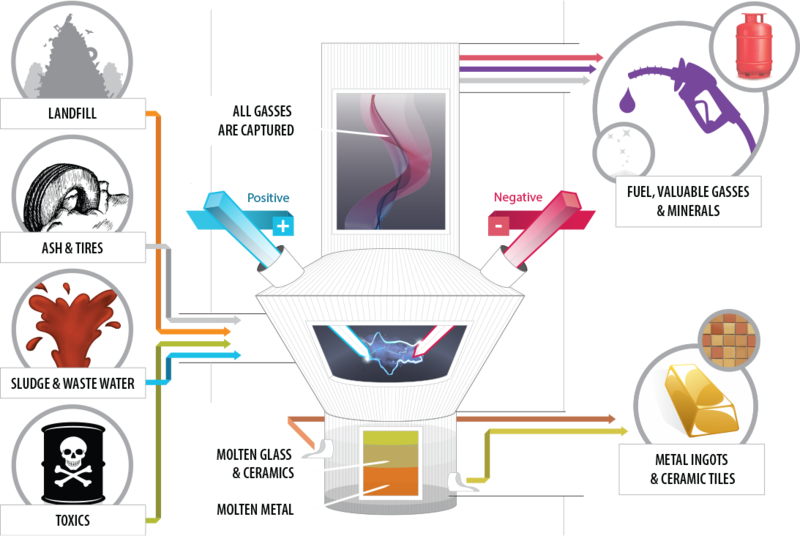 The very same commodities that made the products are converted to a more useful product like liquid fuels. We don't make the products you buy, we make new products out the stuff you have already bought. What was once old is now new again. The Hydrocore Process is a major step in changing the way energy is extracted from hydrocarbon fuels and waste streams for industrial applications. Through the National Lab System, Hydrocore’s chief technology officer was part of a DOE program to construct and operate commercially-viable total waste elimination facilities. 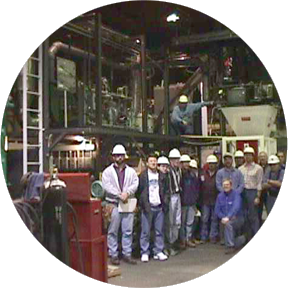 From 1988 to 1995 Hydrocore’s chief techology officer was the Technical Leader of the plasma processing team at the Idaho National Engineering Laboratory that researched and tested various methods to treat hazardous materials into a basaltic waste form. Out of that gigantic study of various melter systems came the recommendations for a quiescent process in an electric arc melter with immersed electrodes. The process and equipment design was tested and improved. 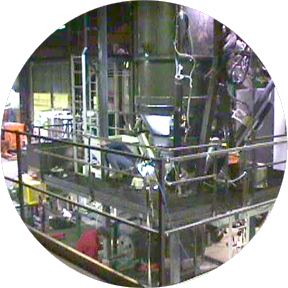 This led the sale of a 5 tonne/day waste processing system to the Korean Atomic Energy Research Institute in Taejon, S. Korea in 1998-9. The final design, construction and operation were completed in a 13 month time frame. 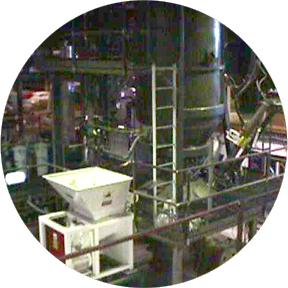 After successfully completing this pilot plant and commercial implementation for other industrial clients, Hydrocore was founded. © 2017 Hydrocore Inc. All rights reserved.